With the continuing mild weather, reckoned to be at least 5oC higher than the expected temperatures at this stage in November, I’ve been slaving away in the garden. I have put off the decorating yet again and have been renovating the rhubarb patch. I established it about 30 years ago and it’s recently been getting very tired and overgrown. 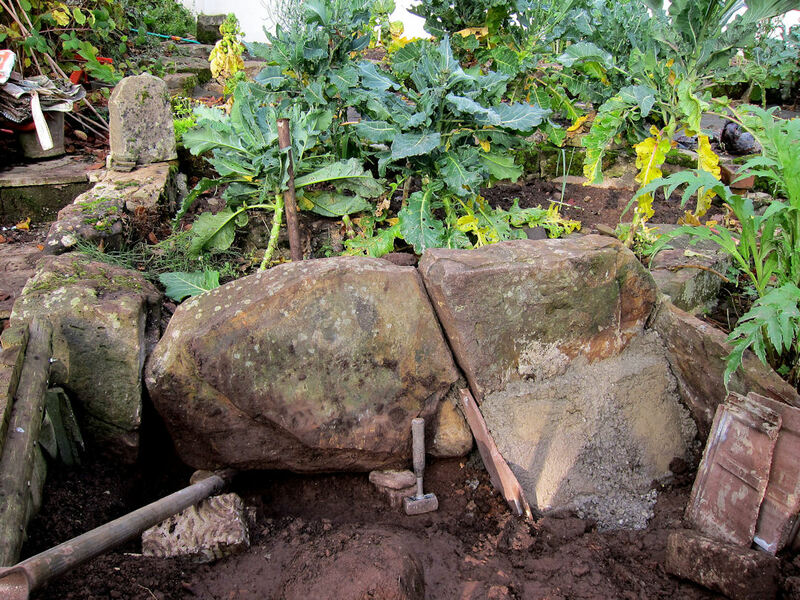 As the lowest part of the stone-terraced vegetable garden it is backed by two large stone slabs set on edge as part of a protection against frosts and so encourage early growth, as well as holding back the creeping soil. But the stone slabs are so heavy that they have sunk into the clay soil and the rhubarb has been overtopping them. The rhubarb has also been migrating to the edges of the patch and trying to climb out with the result that crops have been diminishing. Revamping the patch therefore had to begin with excavating and repositioning the sunken stone slabs. Easier said than done!! For a start they had become deeply embedded in the clay layer underlying the subsoil so a trench had to be dug just to get at the base of the slabs. Then there was the fact that they are both significantly heavier than most of the many other heavy stones in the garden. I can’t remember whether I could pick them up and carry them when I fetched them from the old mountain quarry 30 years ago but somehow I suspect not. However, somehow I got them into the trailer at the quarry, from the front gate about 50 metres down the garden, and then stood them on edge. After 30 years in situ difficulty in handling the weight was compounded by the fact that they were muddy and wet therefore difficult to get a grip on. Or to put it another way, I used a concrete block as a fulcrum and a long metal bar under one end of the slab to lever it up, wedged blocks underneath and then moved to the other end of the slab, repeating the process until the desired height was reached. There were only two real problems with the technique. The first was trying to keep the slabs in a vertical position during the lifting process: the higher they were raised the more unstable they became. The second problem was that it required body-weight for pushing down on the lever not strength to lift it up ….. and I’m just not heavy enough. But putting the fulcrum as close as possible to the load and lengthening the bar increased mechanical advantage and I managed it. I was quite chuffed when I got the first slab in position and concreted it in place and then even more chuffed when I succeeded in getting the second slab fitting snugly next to it. Initially that did require strength because I had had to lay the second slab flat on the ground to deal with the first and then had to left it up into a very precisely sized gap. These were not the largest stones I had moved into the garden and positioned. 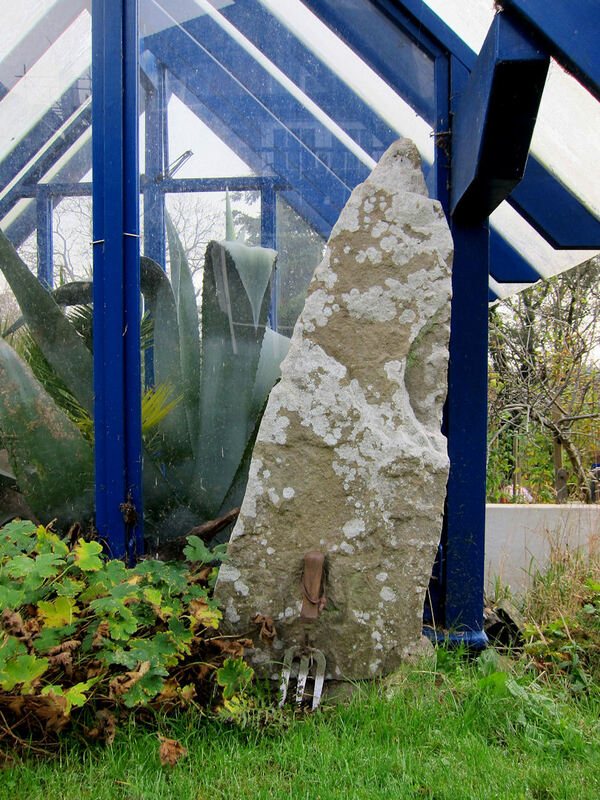 There are two considerably heavier, small-scale ‘standing stones’ which represented quite a challenge 20-odd years ago, requiring the use of wooden rollers to move them into location as well as a good bit of brute force to stand them on end. 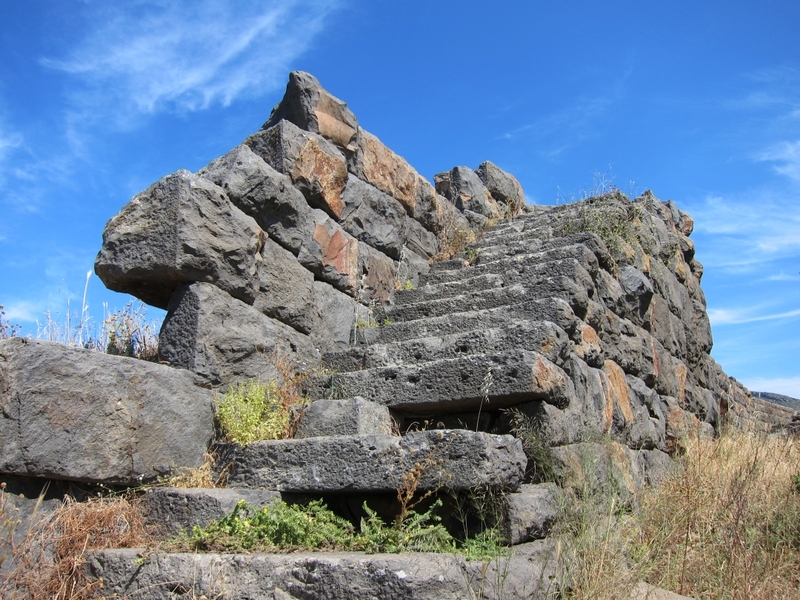 But then I thought of the size of the stones used in the construction of the Paleocastro (πάλiο/paleo = old, κάστρο/kastro = castle) on Nisyros and looked with new eyes at the puny stones I had been working with. 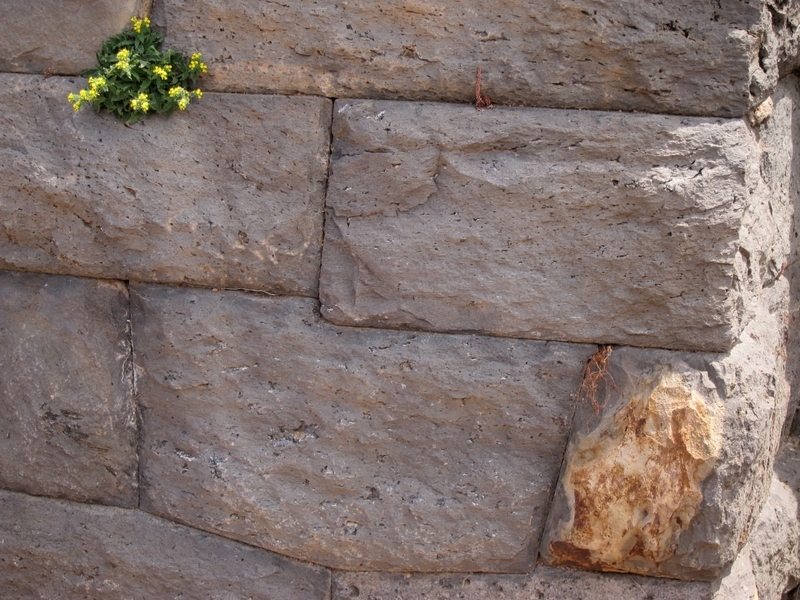 In the Paleocastro individual stone blocks are 2-3 feet high, 3 foot deep and anything up to 12 feet long. Built without any kind of mortar they were cut so precisely that they fit together so tightly that you can’t get a piece of paper between them. Quite apart from getting the stones to the site, the stone-masonry skills to measure and cut the individual blocks, the mechanics of manoeuvring the blocks into position must have been the same simple laws of physics that I was using but on a much more massive scale. 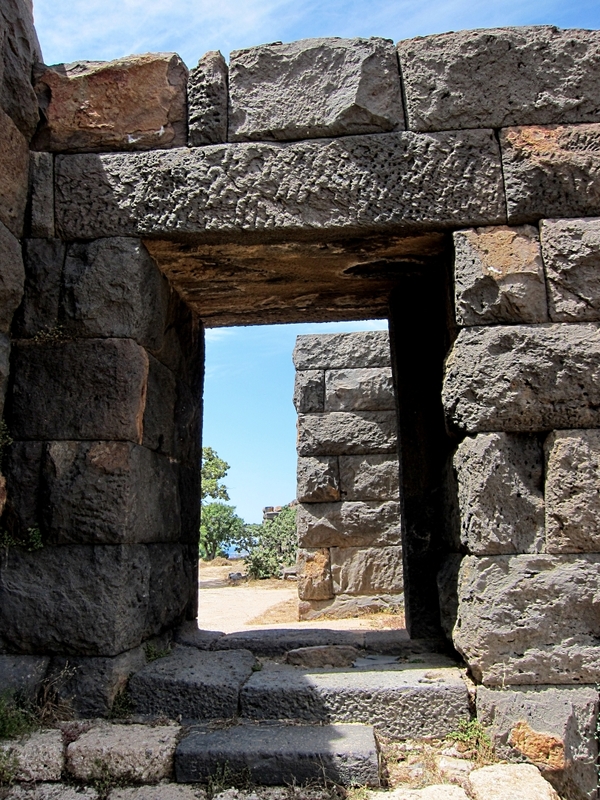 And there are many such massively built stone structures in the ancient world across Greece and other parts of Europe, Egypt, the Middle East, Central and South America ….. Puts my puny struggling and sweating into context but it’s somehow satisfying to be using the same techniques on however small a scale. This entry was posted in extreme gardening, Greece 2011, Pontypool, Reflections. Bookmark the permalink.